Being susceptible to stroke is not a healthy symptom that bodes well with any individual since a stroke attack could lead to permanent brain damage or worse, it could lead to death, if not detected and prevented at an early stage. According to World Health Organization statistics based on the Global Status Report on Non Communicable Diseases for 2014, an estimated 6.7 million deaths reported in 2012 were mainly due to strokes. Issuing a statement on the World Stroke Day on October 29, WHO Regional Director for South East Asia Dr. Poonam Khetrapal Singh also stressed that over 11 million attacks of stroke occur in low and middle income countries every year, which include those of the WHO South-East Asia Region. The need for early detection, prevention and public awareness on stroke is thus pivotal to ensure a healthy well-being. In an interview with the Mirror Medicine, Consultant Neurologist and Head of the Stroke Ward at the National Hospital of Sri Lanka Dr. Padma Gunaratne shared her expert opinion on the different aspects of stroke, its causes and early detection; in an attempt to shed more light and raise public awareness concerning a non-communicable disease believed to be the second leading cause of death for those above the age of sixty years. QCould you explain what a stroke is? A stroke could be defined as rapidly developing neurological symptoms that happen secondary to a vascular etiology. There are two types of strokes that could occur. The first could be a bleeding in the brain known as a Hemorrhagic Stroke and the second is the blocking of a vain caused by a blood clot also known as an Ischemic Stroke. QIn your opinion, what is the leading cause for the increasing rate of strokes reported in Sri Lanka? Worldwide, nearly six million people die, while fifteen million people suffer due to stroke every year. However, seventy to eighty percent of strokes are reported from countries in low- income, developing countries in this part of the world. Lack of sufficient public awareness on stroke is one of the main reasons, leading to the increasing rates of strokes reported in the country. It should be noted that at least seventy percent of stroke attacks are preventable, if detected early. QWhat are the leading causes resulting in a stroke? Stroke is a non-communicable disease. Having non communicable diseases such as high blood pressure, high cholesterol levels, obesity and diabetes in addition to smoking tobacco and alcohol consumption could easily lead to the development of a stroke attack. QCould you elaborate on the best possible way to prevent a stroke? The best possible ways to prevent strokes are through healthy diet practices, regular exercise, and early detection of risk factors-such as high blood pressure, high cholesterol and diabetes, followed by proper treatment. Abstaining from alcohol consumption and smoking tobacco, treating heart diseases and the early detection of stroke symptoms are also very good preventive measures against stroke. Over the years, the Government has conducted lots of tests to control blood pressure, diabetes and high cholesterol through various health screening programmes. However, many patients carry misconceptions with regard to continuing the pills prescribed to them as a part of their treatment procedure. They don’t realize the value of getting themselves screened. Neither do they realize that treatment should be continued once commenced if they are diagnosed with an illness. For instance, if a person is diagnosed with high blood pressure, high cholesterol and diabetes, he or she will have to take several medicines in order to ensure that one’s health condition does not develop into a stroke or heart attack in the later stages. People are not very knowledgeable on this regard and are not aware on how to detect stroke symptoms. There are many heart diseases such as weak heart or valve diseases in which case doctors recommend various medicines part of the treatment. This helps in the process of monitoring the patient’s blood cells, to ensure that the blood is adequately thin and not excessively thin. These medical tests must be done once a month by patients to ensure that they do not develop an attack. Due to a lack of understanding many patients disregard these issues by discontinuing their medication and not attending medical checkups regularly; especially for a blood test. It should be noted that ignoring ones heart disease could also lead up to a stroke in the long run. Finally, immediate action should be taken following the recognition of stroke symptoms in order to prevent the actual stroke attack from taking place. For example if one side of the entire body become numb for about ten minutes and if it is not recognized as a stroke symptom, the patient will not seek immediate medical attention and wait until the worst attack takes place. Unfortunately, this is what happens in most cases. Therefore, more awareness should be created among people with regard to stroke prevention and early detection. QIs there a specific age group vulnerable to stroke attacks? Stroke is very much related to age. For those above sixty years, stroke is considered as the second leading cause of death. However, if a person, diagnosed with diabetes and high blood pressure continues smoking, such an individual would also be vulnerable to develop a stroke at a much younger age. QIn the context of Sri Lanka, do you think that people’s vulnerability to develop a stroke is greater than before? Yes. With the urbanized lifestyle we have got adopted to, people lack sufficient exercise and are accustomed to consuming a very unhealthy diet. Factors such as increased stress, lack of awareness of stroke and a lack of concern for the general wellbeing, have also increased the risk of strokes. QWhat important message do you have for the public concerning strokes? Stroke is preventable and treatable. There are many things the hospitals can do to treat stroke patients. People need to be more aware about stroke related issues and national steps should be taken on a government scale, to prevent such a disastrous disease from taking root in people’s lives. While people should be knowledgeable on how to detect stroke symptoms, it is equally important to ensure that a person suffering from a stroke attack should be rushed immediately to the major hospital within the vicinity. 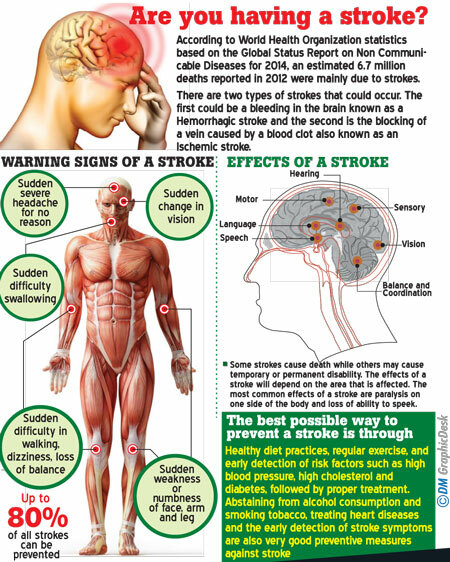 According to experts stroke is the second leading cause of death and the leading cause of disability in Sri Lanka. In order to minimize the damage caused by a stroke, we first have to pay attention to risk factors. Up to 80 percent of all strokes can be prevented by early detection. “Though there are factors we can’t change, mainly unhealthy life styles of people and their carelessness expose them to the risk of a stroke attack,” Kaburugamuwa said. A stroke is an emergency and it happens, when the blood supply to a part of the brain is interrupted. “Stroke loosely used term to describe neurological changes lasting more than 24 hours caused by an interruption in the blood supply to a part of the brain. “If the blood flow ceases for an extended period of time, the cerebral tissues involved die causing permanent neurological deficits. Due to this the opposite sides of the body from the affected side of the brain become paralyzed. Mainly there are two types of strokes. Strokes categorised as Ischemic Strokes occur when a blood clot forms in a blood vessel in the brain and blocks the blood flow. 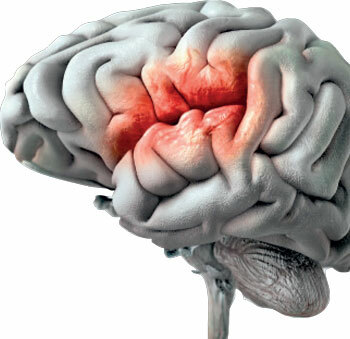 Some strokes are caused by bleeding in the brain due to a rupture of a blood vessel in the brain. This is called Hemorrhagic Stroke. What are the warning signals of a stroke? Sudden severe headache for no reason or an unexplained change in the pattern of headaches. Sudden blurring or decrease in vision in one or both eyes. Sudden weakness or numbness of face, arms and legs. Sudden difficulty in walking, dizziness, loss of balance or an unexplained fall. Difficulty in speaking or understanding Sometimes these symptoms may be present for a long period of time, or it may last only a few minutes to a few hours. 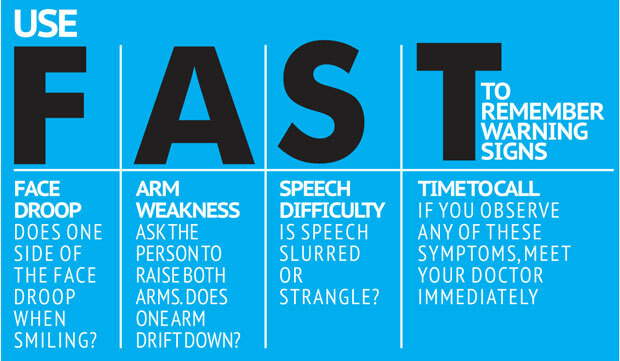 Such symptoms should never be ignored, especially those who are at the risk of having a stroke. These symptoms indicate that a part of the body is not receiving sufficient blood; such a condition if neglected may lead to a stroke. If you or someone you know experience any of the above warning signals, seek medical attention immediately. A person suffering a brain stroke should seek immediate medical attention of an expert Neurologist. If a stroke is identified within three and half hours and the patient is admitted to hospital, doctors can give immediate attention -the rtPA injection (recombinant tissue Plasminogen Activator. That’s the immediate drug treatment method, which aims at reducing the extent of brain damage. If more than three and half hours have lapsed for a person suffering a stroke to seek medical treatment, the delay may have already caused damage to the person’s brain. In such instances it is the general practice of doctors to direct the patient towards rehabilitation. A patient should receive rehabilitation treatment according to his or her condition. This treatment will be determinant of the patient’s optimum recovery from stroke. A multidisciplinary team of Doctors, nurses, Physiotherapists, Speech therapists, Nutritionists, Psychologists and Sociologists will attend to the patient during this course of treatment. They will help the patient to be independent and regain his or her normal lifestyle. Following the treatment given at the hospital, the manner in which a brain stroke patient is treated and cared for at home is also an important component of recovery. Although such a patient maybe partially paralyzed, family members and loved ones must make it a point to take care of the patient’s needs. The patient will try to ignore the paralyzed side of the body because he will not feel anything in this part of the body. Therefore the patient should be encouraged to give attention on the paralyzed side of the body. Those around should attempt to speak to the patient facing the paralyzed side of his body, so that he will try to respond through that part of the body. The patient will sleep in the same angle for prolonged periods due to numbness. In such an instance his caregivers should be very attentive so that the patient will not develop bed sores. The patient should not be allowed to feel lonely. Friends and relatives should be mindful to keep in constant contact with him and encourage conversation with the patient. Then he will receive speech therapy automatically. The patient should receive physiotherapy treatments. Paralyzed body parts of the patient should receive some exercise. Those at home should help him to move hands and legs slowly. Patients who have swallowing problems should receive food through a nasogastric (NG) tube . At home the caregiver should have a adequate knowledge and practice about the use of a NG tube. The patient should also receive a well nourished diet in order to regain his strength. Indian Cultural Centre, Colombo in association with Dhamya Yoga Academy has organized a lecture on Stress Management by Yoga Guru Dr. Vishal Khodaskar on November 8 at 4.00 p.m. at its auditorium at 16/2 Gregory’s Road, Colombo 7, the Indian Cultural Centre said in a communiqué. Dr. Khodaskar completed his DY Edu. (Yoga) and now functions as the Director of Mahatma Gandhi Studies Centre, Amravati, Maharashtra India since 2009 and Chairman of Board of Study (Yoga Education) at the Amravati University, the statement from the ICC said. “He has presented 28 research papers in National and International Yoga conferences in India, China, Thailand, Japan, Singapore, Nepal, Sri Lanka, Malaysia, Kenya and Mauritus. He was awarded Shiv Chatrapati by State Govt. of Maharashtra.